Whenever I share business opportunities here at Gaps, I like to think my posts contain ideas you’ve likely never thought of. My live case study involved building a podcast around reading other people’s articles. I covered a music blogger making over $40,000 per month, charging readers just $1. More recently I wrote about building a six-figure newsletter which highlighted a monetisation angle I haven’t seen others talk about. I don’t say this to stroke my own ego, but because today’s idea is actually quite generic. If I’m totally honest with you, I didn’t think the type of website I’m going to talk about was really a ‘thing’ anymore. I thought their time had come and gone. The type of site I’m referring to, are deals websites. We all witnessed the rapid rise of Groupon and its similarly fast demise as the offers became too much for people to keep up with. A former business partner of mine also saw quick financial success with his deals website, but attention waned as fast as it appeared. As someone who constantly researches online business opportunities, deals websites don’t seem to be ‘hot’ or interesting any more, but the following research might change your perspective as it did mine. When researching ways to drive traffic to a new website, I stumbled across a blog which really surprised me. I wasn’t only surprised by how many visitors it receives, but that it’s still hosted on a blogspot.com domain. Due to family issues, the site is currently inactive for the first time in nine years, but the numbers don’t lie: For years this Blogspot blog has averaged 750,000 visitors per month. The site, Nouveau Cheap, shares daily deals on beauty products. Each day they link to their latest finds accompanied by one or two sentences to describe the offer. People don’t follow the blog for massive in-depth reviews on beauty products, but simple updates on where they can find their favourite brands for less. With 67% of visitors coming to the site directly (SimilarWeb estimate) the author has clearly found an angle that keeps people coming back each day to see if the offers are relevant to them. Ran by a young entrepreneur named Viet Do, Dealzon receives a small commission when visitors purchase the deals they share. Those deals tend to involve games for specific platforms or physical items to go with them. The site has such a long and popular history that in 2011, Fast Company wrote about how people were ‘stealing’ their brand name on Facebook and using it to run ads. Viet states the commission he receives on physical products (such as a laptop) is around 1%. If he sends hundreds of customers to a product then commissions may be pushed up to 3%. For digital items like game purchases, commissions tend to hover in the 4-5% range. “A $100 special super limited edition game [might have] margins a little bit higher where [companies will] give as much as 8%” Viet stated, in an interview with my friend Steve Chou. According to Owler estimates, Dealzon has 38 full-time staff and annual revenues in the $2.5m range. I couldn’t verify those numbers elsewhere (38 staff seems high) but as they’re reaching so many people, the revenue numbers wouldn’t surprise me. Viet says his site is not there to review games and tell you what to buy; it’s simply a resource to tell you what’s cheap, right now. With over 70% of their visitors coming to the site directly, it’s clearly a strategy that works. Like Dealzon, Kicks Deals was launched at the end of 2011 and is still going strong. Reaching around 630,000 visitors per month, the site focuses on finding and sharing the best deals for sneaker heads. What really stood out to me was their ‘upvote’ and ‘downvote’ system, allowing people to have their say on their favourite offers. Their business model replicates that of Dealzon, where they receive a small commission from sales they send to other sites. I struggled to find any revenue numbers for the site as the founder seems adverse to interviews, but I can’t imagine expenses are high for such a simple concept. If you read my most recent article on building a six-figure newsletter, you’ll know about Scott’s Cheap Flights and their flight-deals newsletter now home to more than 510,000 subscribers. Those subscribers are generating the company more than $320,000 per month. A commenter on the article let me know about a UK version of Scott’s Cheap Flights, called Jack’s Flight Club. I loved the design and simplicity of the service – Scott’s Cheap Flights for the UK – and assumed it had mimicked Scott’s success a few years ago. When looking at when the domain was registered, I was surprised to see it only launched in September of 2016. That means Jack’s newsletter has grown by an average of 10,240 new subscribers per month, or 341 new subscribers every day since launch. In such a short period of time his site has been featured in The Times, The Daily Mail and Lonely Planet. The Daily Mail referred to Jack as a ‘professional flight hacker’ and revealed why his audience quickly grew. [Jack] recently took to Reddit to share his advice, and it proved so popular it crashed the inbox of his subscription service and swelled its membership to 45,000 savvy bargain hunters. In other words, Jack went viral on Reddit, and things spiralled out of control from there. His post on the AMA (Ask Me Anything) section of the site talked about how he finds great flight deals from the UK. Even though the post was fairly promotional (which Redditors usually stop in their tracks), Jack received over 16,000 upvotes which is rarely seen on this section of the site unless you’re an A-list celebrity. I couldn’t find any revenue numbers for the site as it’s so new, but as he’s already amassed 1/5th of Scott’s audience, I wouldn’t be surprised if he’s passed the mid-five-figure per month range for his premium offering. I was working on this article before finding out about Jack’s success, but knowing it has been started so recently has to be inspiring if you’re considering building your own deals offering. Mommy’s Freebies, which reaches more than 700,000 visitors per month, is another example of a successful niche-focused deals site. As you can probably guess from the name, Mommy’s Freebies shares deals on anything relevant to parents of babies or toddlers. No offence to them, but it’s really not the best looking site, showing that the content you have to offer is far more important than your design skills. With expectant parents so conscious of their spending, this is a really smart niche to focus on. Taking advantage of the huge trend in vapes and vape juices as more people quit smoking, VapingCheap.com was established at the end of 2013. Now reaching 350-400,000 visitors per month, they’ve found a niche where people won’t necessarily talk about their site, but will search for relevant offers on Google. With over 60% of their traffic coming from search engines, it’s interesting to see that half of the links on their homepage are just affiliate links to items on Shareasale. Whoever is behind the site is clearly familiar with SEO tactics, with articles written in 2014 being reposted on the site as new updates in 2017. This example goes to show you can enter up and coming verticals and enjoy the ride as they grow. While there is a clear focus on coupons and discounts, they also share recipes teaching you how to make anything from chocolate chip cookies to BBQ ranch pork chops. In their last twenty blog posts they’ve received a combined total of one comment, which is surprisingly low for a blog with 369,000 Facebook likes and over 300,000 monthly visitors. It’s clear that people aren’t there for the discussions, but for the deals they can pick up in places like Starbucks, and on things like bibs for babies. Many of their coupon codes are branded – the coupon for bibs is 1FRUGALBABY – suggesting they share exclusive deals by personally work with companies to feature their products. As you can see from the screenshots I’ve already shared, most deal sites are primarily focused on offers, rather than the design of the site that discovers them. Lozo really stands out in that it’s beautifully designed and allows you to search for what you’re looking for before buying it, rather than showing random deals around a specific topic. Reaching up to 600,000 people per month, Lozo receives over 250,000 of its monthly visitors from other websites which share the deals they find. While Lozo is laid out more like a ‘coupon brand’ rather than a deals blog, it’s yet another example of how niche you can be and still succeed with this model. When looking for more examples of niche-focused deals website for this article, I came across Unidays but quickly dismissed it. It’s branded towards a specific audience – students – but really seems to offer anything to anyone. When asking why she stopped using the site, she said she no longer has a student card. If it wasn’t for that conversation, I wouldn’t have realised that they require you to be a student (and use your student card) to get deals, rather than just sharing deals for people interested in certain items. I also wouldn’t have looked into their revenues and known this: They’re the 9th fastest growing tech company in the UK, with £11.4m revenue in 2016. Today Unidays is a huge brand in a position to barter deals with other huge brands, but started out as a hobby for founder Josh Rathour. For an industry I didn’t realise was even ‘going’ any more, they’re now pulling in some incredible numbers. Not only is Gaps about sharing online business ideas that are successful, it’s also about finding opportunities to use those ideas in another niche or location. The most obvious opportunity is to take an already successful site and put a ‘twist’ on their targeting by focusing on a different audience. Jacks Flight Deals did exactly what I suggested a few years ago when I covered Scott’s Cheap Flights. [Scott] is only targeting the United States. This means if you speak another language or you’re based somewhere else where people have larger travel budgets (like the UK, Australia and Canada) there would be no reason you couldn’t create a competing service and do very well with it. I’m not saying Jack reads my website – he probably doesn’t – but his approach was smart: Find what someone is doing in one area or for one niche, and then build it for another audience. Though Scott’s Cheap Flights does offer opportunities to get updates on flight deals in Europe, it’s still fairly broad and open to more country-specific competition. I’m going to start experimenting with this angle myself, with my first attempt being a foreign language version of a successful example I’ve shared above. With a number of runners in my family, I was surprised to hear many subscribe to some form of deals site for their favourite form of exercise. I was surprised because running isn’t really a hobby that requires you to purchase anything besides shoes, and even running shoes don’t get purchased too often. When I inquired further, they said they don’t subscribe to the newsletters because they make a lot of purchases, but because they want to regularly check deals in case a usually high-ticket item suddenly becomes cheaper than normal. That could include normal running shoes, running spikes for cross country, a backpack for running or similar. Items that runners can easily spend upwards of $100 on are often worth the weeks of waiting to find a great deal. I know I’m biased but I really like that last idea. People building out home gyms can spend hundreds or even thousands of dollars on a single piece of equipment and would likely have the patience to wait for the best offers before upgrading their set-up. There’s also other things you could offer users like protein powders, creatine and gym deals for when they’re out of town. If you haven’t been following what I’m doing on Detailed, each weekday I share opportunities you can use to promote your online ventures. I’ve already shared around 35 opportunities on the site, with my private spreadsheet currently containing at least 180 more to write about. One topic I have on my list to talk about is something I’ve seen a number companies use as a link building opportunity, and that’s military deals. JCPenney is one such example, as they offer a military discount which has had bloggers talking. This single page on their website has picked up 293 backlinks from 83 different websites, most of which curate places where members of the military can get discounts online. I’ll be honest, there are quite a lot of deals sites in the military space. If you were to create your own, you certainly wouldn’t be the first. That said, the ones that do exist seem to have done a pretty poor job of designing and branding their sites. I can’t be too harsh here – they’ve created something valuable for people who have risked their lives for their country – but they could certainly be easier to navigate. If you have any personal history in the military or any family members in service, this could be a more personal project you wish to take on. Defence Discount Service, focused on the UK, averages 100,000 visitors per month, reaching a high of up to 400,000 monthly visitors. I think the site really needs a major update in terms of design and layout to be more useful to visitors. The Military Wallet has had months reaching in excess of 1.5 million visitors, and consists of a simple design that others could mimic. Although the sites are popular and serve their purpose, I really think there’s a gap in the market for someone to improve the user experience and make deal finding much more public and updated. When I originally wrote about this opening, I said that I couldn’t really give specifics on how to find deals as it would really depend on what you’re covering. Advanced airfare searches wouldn’t really be relevant for anything other than, well, airfare. Whatever niche you’re interested in tackling, your source for finding the best deals will likely involve different websites and different queries or systems you can put in place. That said, I still wanted to give some more specific examples to wrap up this article. When it comes to design, I really like the simple layout of Nouveau Cheap. While the site is hosted on Blogpost, it still follows a traditional blog format (which I implement here at Gaps and on Detailed) so I wouldn’t try to create anything ‘fancy’ like Lozo. As we can see from many of the designs in this article, what your site looks like is barely important compared to the deals you’re sharing. Forgive my poor Photoshop skills, but I honestly wouldn’t create anything more complex than this to start with. That means anyone interested in all things automotive. One way to validate your idea is to head to Google and search for deals related to your niche. You can change the results to only show updates from the past month to make sure you would be able to find regular offers, as shown below. 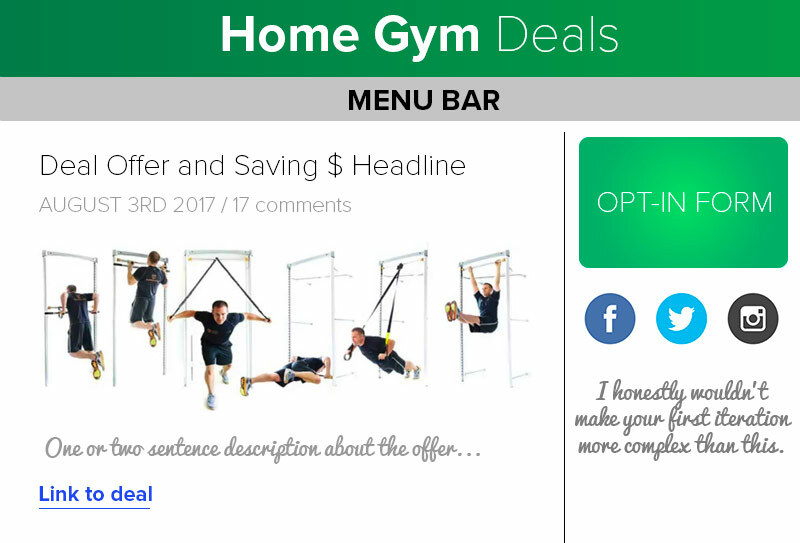 Another option is to head to a more ‘generic’ deals website, such as Slickdeals, to see what kind of offers they’re sharing. They have an entire category dedicated to car oil, wax, automotive magazines and more. These were incredibly easy to find, provinig that if I did build a deals site in the space, I would have offers to share. Remember that you’re not creating mammoth articles each day — Nouveau cheap is literally just a headline, a picture, and a link. There’s no reason you can’t do the same. Once you’ve got the deals in place, then you need to promote the site. I recently took a hiatus from writing Gaps updates as I found myself constantly offering fairly generic advice on how to promote any sites you miight build from my ideas. I wanted to share proven traffic strategies you could actually use to drive traffic, so built Detailed.com to share the best examples I can find. Because there are so many ideas on Detailed to help you with promoting the site, I no longer have to share the usual “join forums” or “engage in Facebook groups” advice here. That said, there are still some interesting ways that these sites are promoting themselves. I thought a list-based approach was appropriate, so I hope you don’t mind the slightly odd formatting. Dealzon frequently writes guest posts for a site called TechRaptor which itself reaches more than 400,000 visitors per month. KicksDeals regularly have a large ‘generic’ coupon site – Slickdeals – mention their latest offers. Jack’s Cheap Flights went viral by opening himself up to questions on Reddit before being picked up by a number of large news sites. For a while, KicksDeals received a lot of mentions from the UK’s Complex Magazine. I’m not sure if this was an organic or paid promotion, but Complex do offer advertising on their site. The Frugal Girls has people linking out to their recipes when they do round-up posts. Here’s the Humbled Homemaker with one such update. Unidays has grown so big that they can now leverage deals with huge brands like Apple, which gets even huge blocks like Lifehacker talking. Mommy’s Freebies has another brand, The Mommy Guide, which funnels traffic back to their deals website. Dealzon appear to be working directly with bloggers, with one post on GameTyrant showing nothing but their deals. The author stated “Dealzon has just updated me” which suggests there may have been payment or at least a friendly-relationship to help make the article happen. KicksDeals has become a key source for other sneaker deals sites, who repost their deals. Sneaker Steal is one such example. Lozo have widgets embedded in the sidebar of sites like Kroger which allow people to search for coupons via other websites, and then end up at Lozo. The Frugal Girls continues to have more ’round-up’ style blogs linked to them. A financial blog, Prudent Penny Pincher, links to them multiple times per month. Dealzon’s model lends itself to a lot of free press. Because they’re so focusing on hunting deals, they give game-focused sites something to talk about when they find something special. Kicksdeals receives a lot of traffic from sneaker-focused forums who reshare their deals. Niketalk is one such example. The Frugal Girls receives up to 40% of their traffic from social media, with almost 100% of that coming from Pinterest. Don’t neglect to create pin-friendly pictures with your updates. While there are dozens of different angles to try, for my own site I would start by interacting in relevant forums – there are literally hundreds in the automotive world online – and let people know about my site sharing the deals. Because there’s so much value to offer, it’s likely that people will appreciate you sharing your updates, even if you’re new to the community. If you’ve been looking for a new online venture, starting a niche-focused deals website might just be the next project for you. If you have any questions (or suggestions), I’m always open to feedback.